Samsung is serving best android mobile phones in India since 2009, in every year it surprise its audience with loaded features and plenty of user benefits. Its newly launched Samsung galaxy On7 does the same with interesting features like geo-tagging, face detection, touch focus and many connectivity options. The phone was recently launched in October 2015 and had reached good sales record in minimal days. The phone has a wider screen size of 5.50 inches and excellent resolution of 720X1280 pixels. The Samsung galaxy On7 is engineered with quad-core processor 1.2GHZ and 1.5GB of RAM. The internal storage space is 8GB and it can be extended up to 128GB using the micro SD card. Photos are the memory of a life so, Samsung galaxy On7 comes with 13-megapixel rear camera and for selfie shooters the front camera is 5-megapixel. The phone is powered by android 5.1.1 lollipop series and its removable battery capacity is 3000mAh. The phone measures with 151.80X77.80X8.20 of height X width X thickness and the weight is about 172 g.
It supports dual micro SIM and includes connectivity options like 3G, 4G with LTE support, FM, Wi-Fi, Bluetooth and GPS. The phone has many sensors like proximity sensor, accelerometer and ambient light sensor. 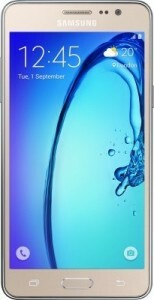 The cost of the phone is about 10,990 INR and the available colors are gold and white.